In October, 1981 the double-walled liner was in place and we started filling the pool with ultra-pure water. 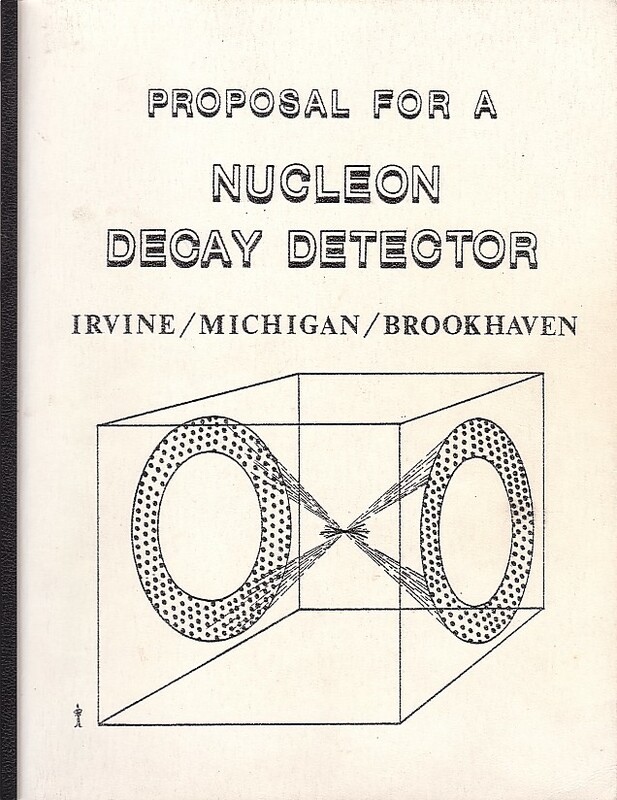 At a depth of 11 feet the expected signals from cosmic ray muons looked good. However some small leaks developed and the water was emptied in order to make repairs on the liner. 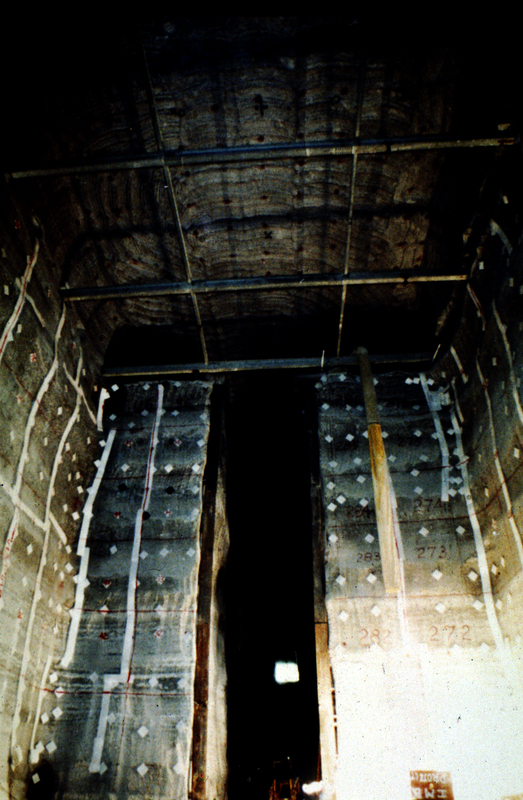 In January of 1982 we started to refill, but at a depth of 13 feet a new large leak developed. We needed to rethink the problem of how to contain this much water. 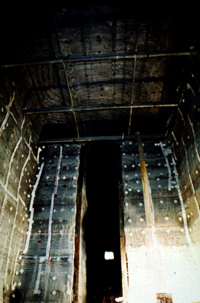 A scheme was devised to support the liner by pouring low-density concrete on the outside at the same rate the water was introduced on the inside. 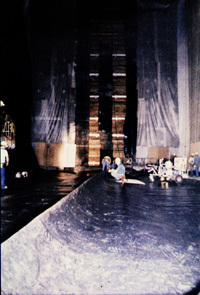 This was a slow process but it worked well and the full 70 foot depth was reached in July, 1982. At that point all of the electronics and the data acquisition computers were in place. We started to record our first events. 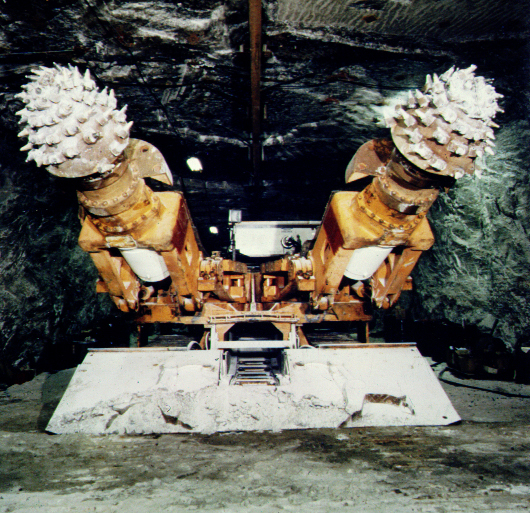 Even though the detector was 1900 feet underground, cosmic ray muons went through at a rate of three per second. Since our design goal was to identify as few as one proton decay per year we needed to find one needle in a haystack of 100 million muons. The pictures below show how this was possible. 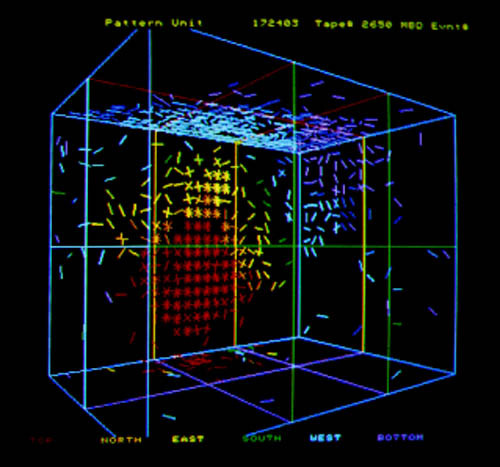 This computer image shows seven cosmic ray muons (yellow lines) going through the detector simultaneously.Charged particles like these emit a cone of Cherenkov light which travels through the water and hits the photomultiplier tubes (PMT's) covering the six walls of the detector. Each slash represents one Cherenkov photon hitting a PMT. The colors indicate the time the PMT was hit. The color scale at left gives the time in nanoseconds (ns). The scale is negative, starting around -300 ns and ending around -220 ns. A typical cosmic ray takes about (300-220)=80 ns to traverse the 80 ft detector at a speed of about one foot per ns (essentially the speed of light). 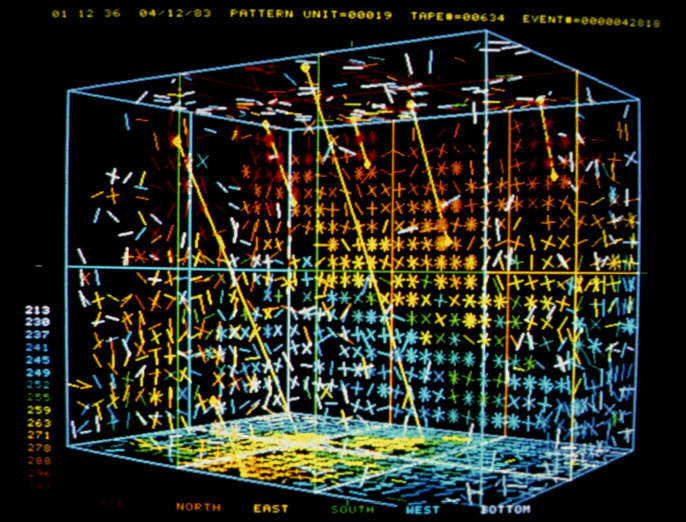 The paths of the muons are reconstructed from the PMT data to within an accuracy of a few degrees. The above 7-muon event is rare..... muons usually go through one or two at a time. The event at left is even rarer, occurring only about once a week. 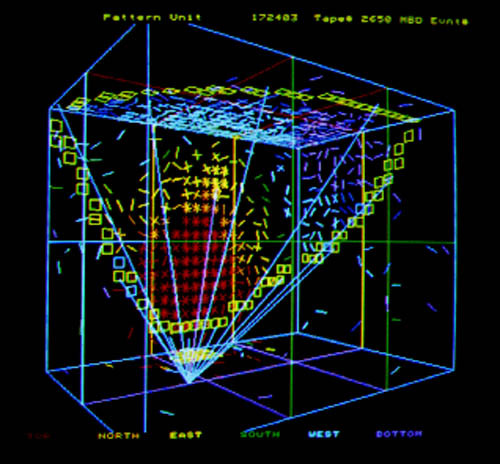 It is a muon going through upwards from the BOTTOM (indicated by purple rectangles) and exiting at the TOP (red rectangles). 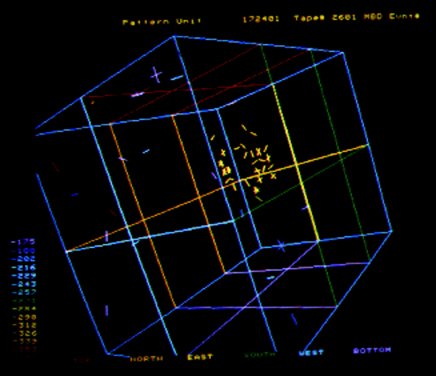 This muon was not generated in the atmosphere above (like the down-going ones) but in the earth itself below the detector. A high energy neutrino generated in the atmosphere on the other side of the world passed all the way through the earth and happened to interact just below the detector to produce the up-going muon. This event is also an upward-going muon that enters the BOTTOM near the NORTH wall (back wall in this view). The muon doesn't go all the way through the detector but skims along the NORTH wall and stops in the water about 2/3 the way through. 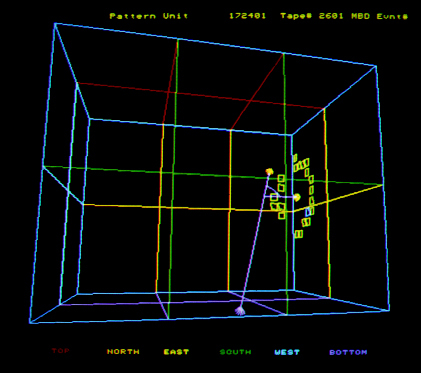 This muon generates a Cherenkov cone that can be seen developing in time by mousing-over (not clicking) on the buttons. 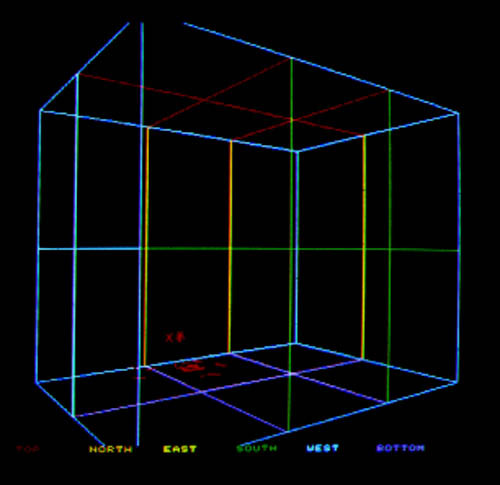 The yellow squares in picture 5 show where the outside of the Cherenkov cone intersects the NORTH, TOP, and EAST walls. The pictures are about 20 ns apart in time. before slowing down and stopping in the water. with a nucleon (proton or neutron) in the water. Such tracks make a single thin Cherenkov cone which lights up a ring of PMT's. the size of the ring of tubes will depend on how far away from the wall the track started. Looking down into the tank we see a large Cherenkov ring hitting the TOP, SOUTH, WEST, and NORTH walls. It's difficult to discern a ring in this view. The ring is much easier to see in this "fisheye" view in which the observer's eye is put at the origin of the muon track. 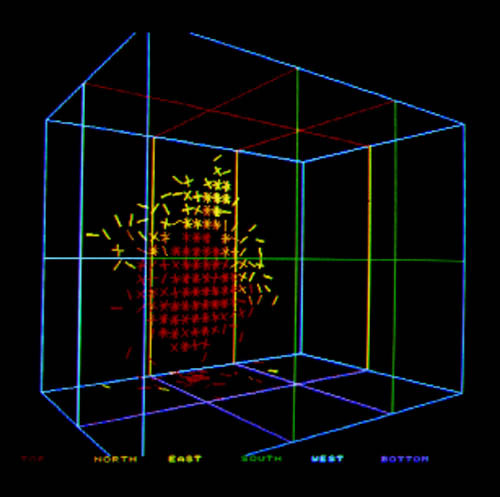 This shows the hits are projected onto a sphere whose center is at the fisheye. The sphere is then opened up so the ring is in the "forward" hemisphere. The green ring is the outer edge of an ideal 41 degree Cherenkov cone. A perfect track in a perfect world would have all the hits be the same color and just inside of the green circle. 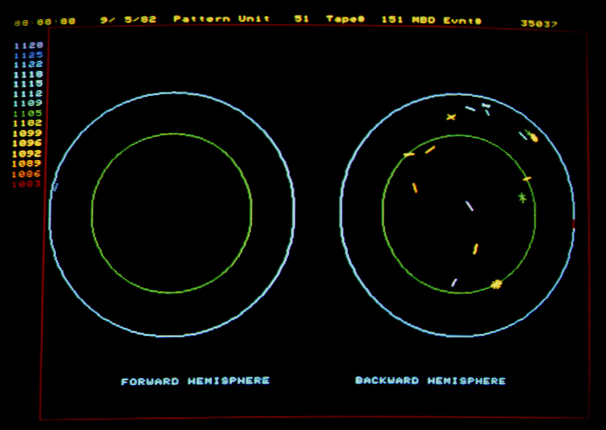 Note that the "backward" hemisphere is empty for this single-track event. It represents only one-half of what would be seen in a true proton decay event. Protons are essentially at rest in the water and their decay must result in at least two new particles going in opposite directions. 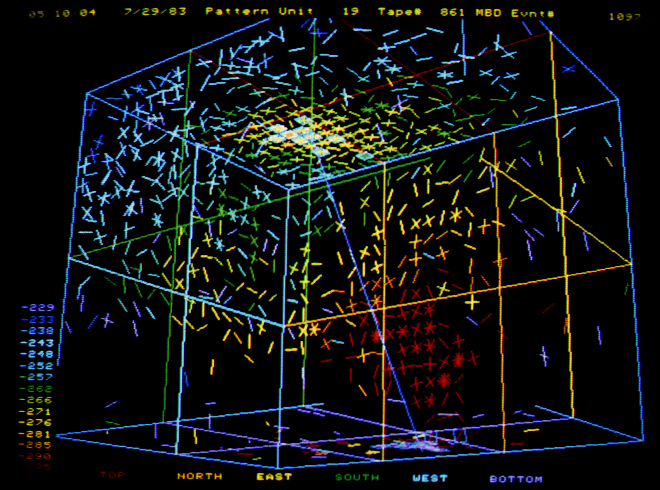 We use this feature to distinguish proton decays from neutrino interactions in the water. 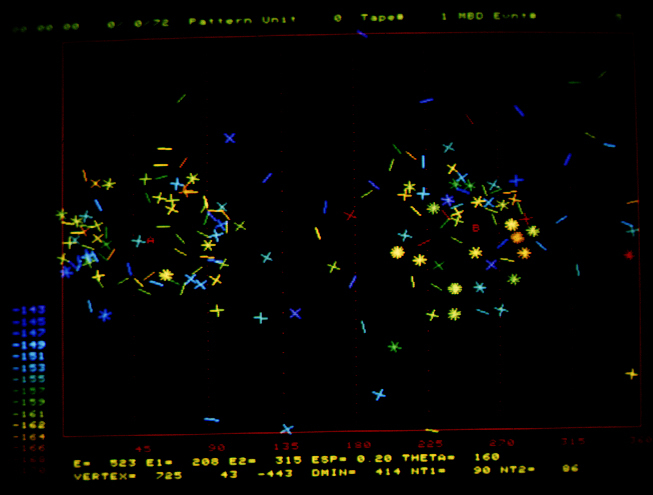 a proton decaying into a positron (e+) and a neutral pion (pi0). These particles would give rise to two Cherenkov cones going in opposite directions. The event at left is an artificial ("monte carlo") event which gives an example of what a realproton decay into e+ and pi0 would look like on the cylinder plot. The two rings are not very well-defined here because the electromagnetic showers produced by the e+ and pi0 contain several electrons and positrons with scattered directions. 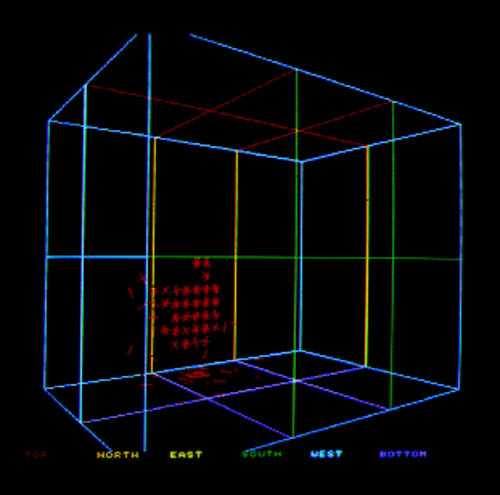 The two red A and B points are where the computer estimated the centers of the two showers were pointed. The calculated angle between the shower directions was 160 deg., which is near the 180 deg. angle at which they were generated. 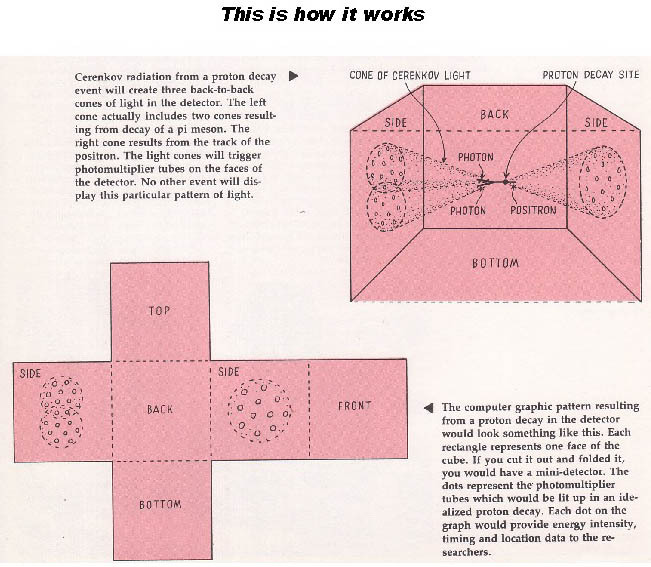 A real event which is similar to this one is seen in the cylinder plot on the left below. that don't match proton decay. Any one of these is sufficient to reject it. These properties are explained below the pictures. It has too much total energy. Qualitatively one can see many more total slashes than on the plot above it. Quantitatively it's total energy is estimated to be 1230 MeV, too far from the 938 MeV value expected from a proton decay. Secondly, it's clear from this sphere plot that the two showers are not 180 deg apart. In fact the measured angle between A and B on the cylinder plot is only 135 deg: too far from the expected 180 deg of a proton decay at rest. 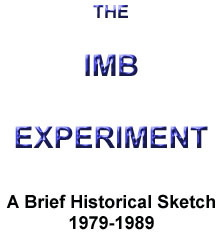 The IMB detector had a "T2 time scale", designed to capture the signal from a muon decaying into an electron a few microseconds after the main event.This would indicate that one of the tracks in the main event was a muon. A picture of the T2 time scale above clearly shows a signal of an electron in the vicinity of the backward-hemisphere track on the sphere plot, so this event can not be due to an (e+,pi0) decay mode. It could perhaps be a (mu+,pi0) mode but then the energy and angle requirements would still rule it out. So if the above event is not a proton decay, what is it? The above event is one of 69 that were found inside the IMB detector in its first 80 live days of operation. This event rate agreed (within a factor of two) with expectations due to neutrino interactions in the water. The neutrinos are produced by cosmic rays hitting the atmosphere all around the Earth. Billions of them pass through the detector every second and from every direction. About once per day a neutrino will interact in the water producing some charged particles which leave telltale Cherenkov rings. 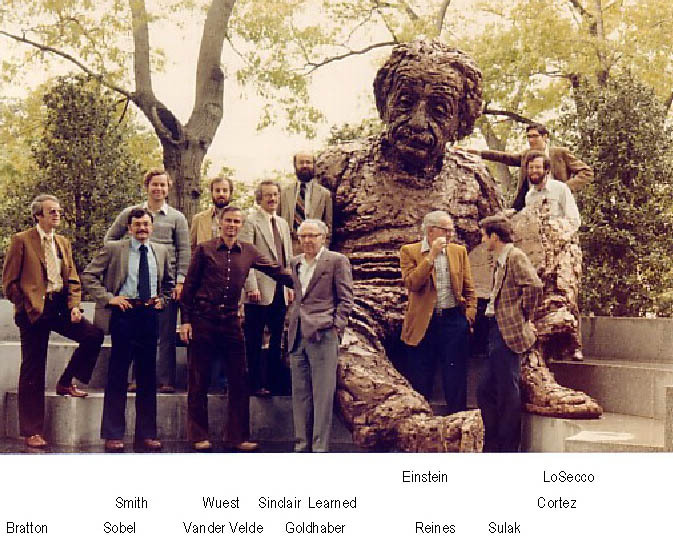 Of the first 69 events only three vaguely resembled the hypothesized proton decay into (e+,pi0). Upon closer examination all of them, including the one pictured above, were eliminated. for this decay mode, was at least 6.5 X 10^31 years. 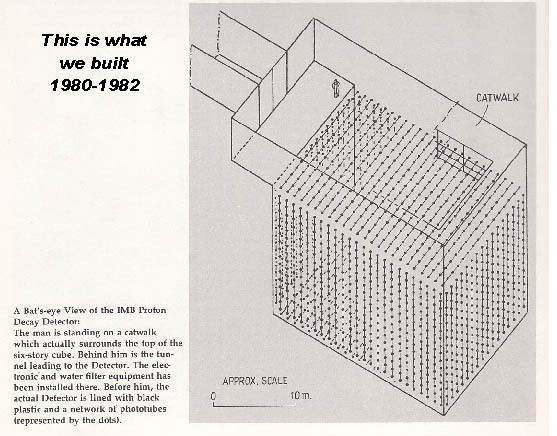 This result was published in the first IMB paper in 1953. The title page is shown below. including 11 graduate students who contributed greatly to the success of the project. 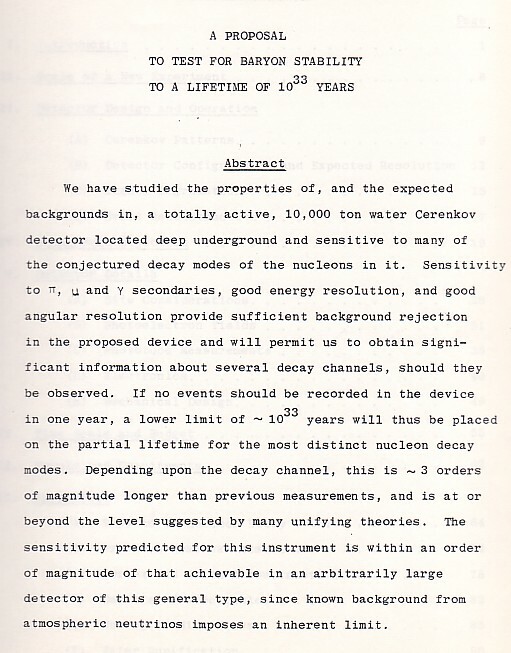 Since some of the rare decay modes would give rise to much less Cherenkov light than the canonical (e+,pi0) mode it was obvious that the search for such decays would be facilitated by increasing the detector's light sensitivity. 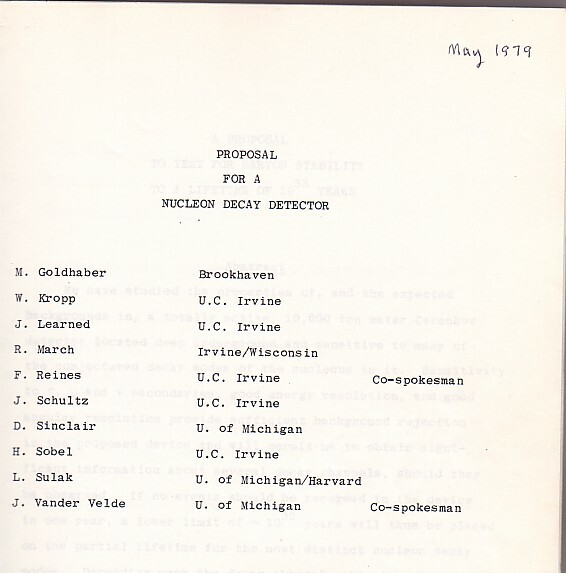 A proposal to do this was presented to the Department of Energy in the fall of 1983. The proposal was approved in the summer of 1984 and over the next two years we replaced the original five-inch PMT's with 2048 eight-inch PMT's embedded in wave-shifter plates. about a factor of 25 below the signal that would be produced by the (e+,pi0) mode. a surprise we would have missed if we hadn't upgraded our light sensitivity. gravitational instability of massive stars. a supernova explosion close enough to be seen with the naked eye. A massive "blue giant"
it took that long for the light to get here. in a few seconds, an almost empty shell and suddenly collapses. The rebounding matter and energy becomes a very dense, and very bright, source of light. 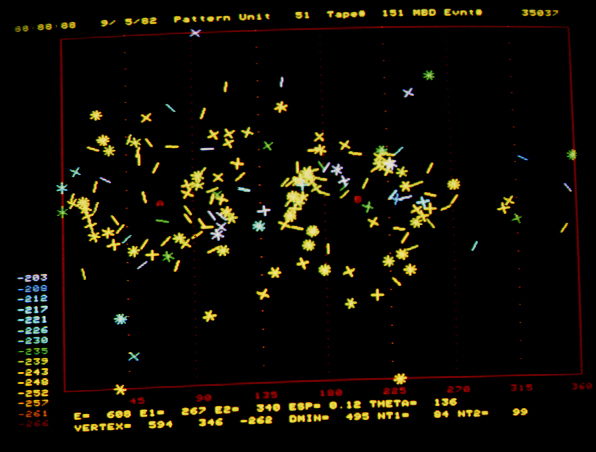 Suddenly the object becomes hundreds of time brighter than its progenitor star. 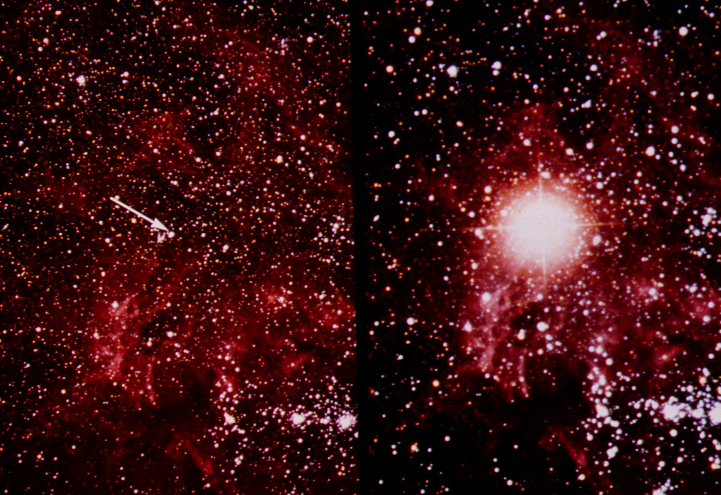 The "before" and "after" pictures for SN1987a are shown below. The arrow on the left shows the progenitor star, Sanduleak -69 202. The picture at right shows it shortly after the explosion. hot (10^10 deg) that huge numbers of neutrinos, electrons, and photons are created. most of the explosion energy. 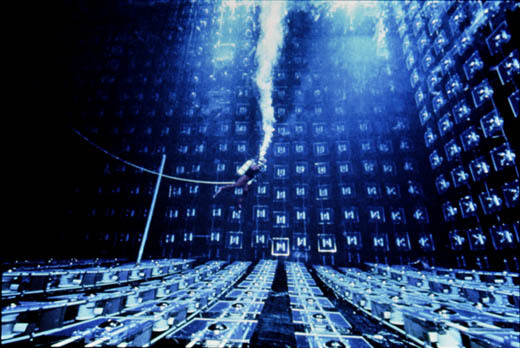 The number of neutrinos emitted is extremely large... about 10^57 escape in a few seconds. 150,000 light-years in radius.... big enough to encompass our whole galaxy. a few light-seconds thick (about the distance from here to the moon). to be detected.... all near the lower limit of our energy threshold. per week, so seeing 8 in a few seconds meant something truly unique had happened. 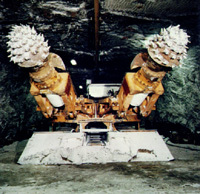 Pictures of one of the events in the IMB detector are shown below. In this view the long purple line is the known neutrino direction coming from the Large Magellenic Cloud. 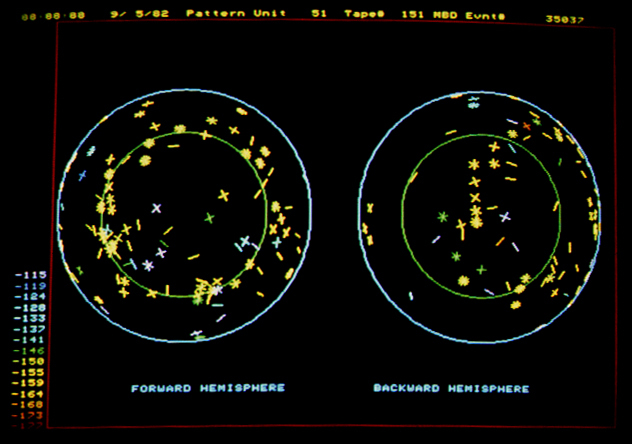 The short purple line going right is the positron direction and the yellow squares show where its Cherenkov cone hit the north and east walls. it has to be called luck of the purest form. But then, as they say, timing is everything. in Japan's Kamiokande detector at the same time. These two experiments were the first to see neutrinos from a supernova. explodes close enough to be recorded in neutrinos. 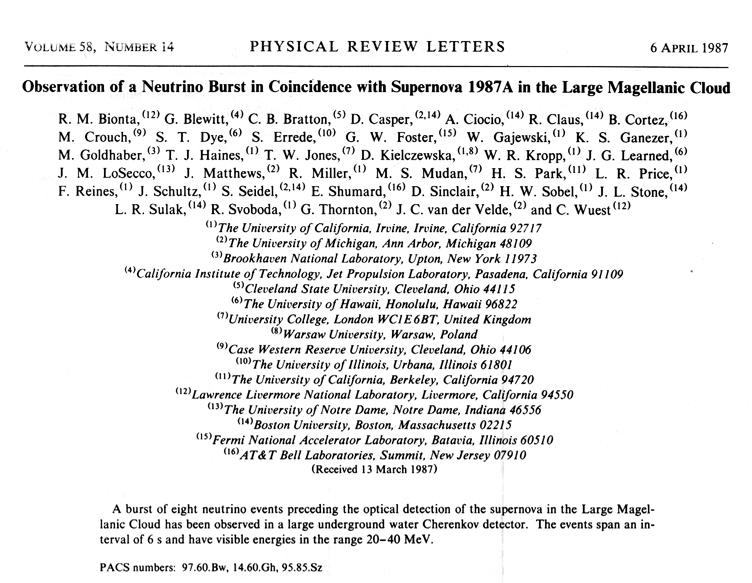 These events gave a remarkable confirmation of theoretical models of the physics of supernovae. They also allowed unique measurements of the mass, lifetime, and velocity of neutrinos. perhaps tripping off other detectors being watched by other civilizations. and become too weak to be seen in some other far-away galaxy.